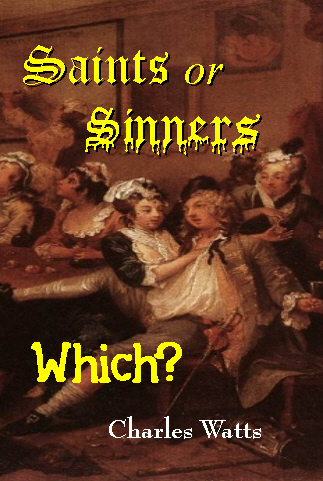 Historical Reprints Religion Saints or Sinners? Which? Religious opinions have everywhere in the past influenced men's minds on the questions of morality and what should form the basis of ethical codes. No one will deny the fact that the conceptions formed of God will depend largely upon the characteristics of the people among whom the conceptions are formed. The gods of savages simply reflect the feelings and ideas of the race where the god belief obtains. They are cruel, brutal, revengeful, and licentious, according to the characters of the worshippers; and the methods resorted to for appeasing them will be just those by which the worshipper would like himself to be approached, and which would afford him some sort of gratification. In Greece graceful harmony, beauty, and the highest development of art were personified in its mythology. As character and culture became elevated, the conception of God becomes more lofty. The different views of God which obtain have modified the conception formed of offences against God -- in other words, sin. The moral law has often been molded by the religious conception. In ancient Egypt so great a crime was it considered to kill an ibis that whoever did so was put to death. The Spartans were encouraged to steal, it being thought quite moral to do so. Falsehood and deceit were deemed praiseworthy among the members of the early Christian Church. In fact, lying was regarded as a virtue if it were indulged in for pious purposes; and St. Paul evidently justified such acts. Even to-day lying is deemed to be no sin among some people -- the Chinese, for instance. Hundreds of other cases of a similar kind might be given; but these will suffice to show that the conception of sin among one people is the reverse of what we meet with in another. It will now be apparent that, in the conventional sense in which the word "sin" is employed, it may be completely dissevered from vice or immorality. Two sets of duties are recognised by religious persons: one relating to God and the other to man. The neglect of the first class is sin, the omission of the other vice. As before stated, the latter are largely influenced by the former; but still it is the violation of the law arising out of the former that constitutes sin, and the sinner is he who is guilty of such violation. We have, therefore, a class of acts which are right or wrong, independent altogether of any sort of relationship that they may sustain, apart from theology, to mankind, and these acts will be deemed sinful or holy in proportion as they fulfil certain religious conditions. For example, a man planting a few flowers in his garden on Sunday would be held in Canada and Scotland to be guilty of a grave offence against God, although he had not in any way injured his fellow man, or in the smallest degree violated any moral law, except such as was supposed to be involved in the religious code. The disseverance of the moral and religious duties is not so marked to-day as in the past, simply because religion, as a distinct thing, is less recognised. The intelligent preacher of the present time -- at least among the Protestants and outside the ultra-orthodox party -- devotes himself to expounding moral duties and enforcing such acts of conduct as, whatever their relationship may be to a future world, have very much to do with the life here. But in the past, and even now among Roman Catholics and the extreme orthodox party, the religious duties greatly exceed the moral ones, and hence sin is more common than immorality, and the Sinner, consequently, much more conspicuous than the vicious man. Why Christianity is Still Professed. The Nature And Value Of Christian Evidences. The Personality and Character of Christ.